If you are even remotely interested in travel, you can be sure that Australia is somewhere at the top of the list for places you would like to visit during your lifetime. But what are you going to do when you get there? Spread over 6 states and 2 territories are some of the worlds incredible natural wonders such as the Great Barrier Reef and Uluru, alongside cosmopolitan cities and cute towns, over 500 National Parks and in and around them are thousands of experiences and Australia tourist attractions that will make your visit memorable. To get you started we’ve created this epic guide containing over 100 Things To Do in Australia – I wonder how many have you ticked off already? And how many more you add to your list as you scroll through! 100+ Incredible Australia Tourist Attractions you have to experience in Oz! If someone says Australia, most people immediately think of Sydney. The iconic Opera House and Harbour Bridge are iconic Australia tourist attractions and have long been huge draws for people both living in and visiting Australia and if for only those two reasons alone it deserves a spot of the Big Australia Bucket List. But that isn’t all Sydney has to offer: there’s beaches, botanical gardens, museums and so much more. Click to find out all about this incredible city and how to make the most of a weekend in Sydney. Voted the world’s most livable city for 7 years running (2012-2017) it is undeniably Australia’s cool kid. With its famous laneways, adorned with incredible street art, hiding stylish cafe’s, cutting edge restaurants (with plenty of food tours!) and funky bars, it’s a dream for any foodie. Add in world class shopping, and every major sporting event in the country (most of which are held at the MCG (Melbourne Cricket Ground)) and a variety of Melbourne attractions such as the Old Melbourne Gaol , the Eureka Skydeck and the Melbourne Aquarium, and it’s clear that Melbourne certainly has something for everyone! The capital of Western Australia – perpetually warm and sunny Perth. Or at least the states ad campaigns have convinced me of! When the Swan River meets the coast and beautiful sandy beaches line the suburbs, it has a collection of natural wonders within it’s state lines that everyone should see at least once in their lives. From the seaside city of Freemantle; the wine producers of Margaret River, the geological marvels that are the Pinnacles, the abundant sealife at Monkey Mia and Ningaloo Reef; and not to mention famous-for-sunset-camel-trains Cable Beach up in the north. Perth is your gateway to some of the greatest sights and experiences Australia has to offer. Adelaide is South Australia’s cosmopolitan coastal capital. Home to two of Australia’s best museums – the Art Gallery of South Australia, displaying expansive collections of Indigenous art, and the South Australian Museum, devoted to natural history. Known for it’s abundance of Australian wildlife on Kangaroo Island, and the majestic Murray River, Adelaide is also the gateway to 4 different wine regions: McLaren Vale, Clare Valley, Coonawarra and the Barossa Valley – a firm foodie favorite, and the home of one of Australia’s greatest exports – Maggie Beer. Brisbane is the capital of Australia’s most populous state, Queensland and is the gateway to Australia’s most loved ‘holiday’ destination. The city combines art and culture with museums, creative spaces and hip restaurants which are paired with man made beaches and manicured gardens to create a one-of-a-kind type city. Outside the city you’ve got a whole heap of destinations to chose between – from the beaches of the Sunshine Coast, theme parks on the Gold Coast, Australia’s adventure capital of Cairns, Great Barrier Reef gateway cities of Port Douglas and Airlie Beach and not forgetting the Daintree Rainforest and a wildlife sanctuary in practically every city. There’s just so much to do it could be hard to decide where to go first! Tasmania’s capital is tiny by comparison to the other state’s capital, but boy does it pack a punch. Combining the history of Port Arthur, the isolated beauty of Bruny Island, the hip market scene at Salamanca Place and some of the best fish and chips you’ll ever get your hands on on Constitution Dock, it’s the perfect spot for a weekend break – or starting point for exploring the rest of Tasmania. Welcome to the Northern Territory’s unhurried capital, with its balmy nights, colourful characters and outdoor adventures. Situated on the Timor see it is the largest city in the very sparesly populated Norther Territory. As well as markets, crocodiles and cruises, you’ll find strong Aboriginal cultures here, as evidenced by the array of languages spoken in the streets, and the vibrant Aboriginal art that fills the city’s galleries and museums. As the city is almost closer to Asia than any other Australian cities (flights to Bali or Cairns take the same amount of time!) also means you’ll also find strong Asian influences, especially in the energetic food scene and night markets. As Australia’s capital city (and the home of Parliament House), Canberra is home to a mix of residents who’ve relocated from larger cities such as Melbourne and Sydney to work in politics, government and media. (Which all sounds incredibly dull) But Canberra has upped it’s game in recent years and shouldn’t be missed off your Australian to-do list. From the haunting, daily, last post ceremony and National Gallery and National Arboretum to the cool climate wineries and funky new urban precinct of NewAction – home to some of Canberra’s best restaurants, cafe’s bakeries and bars. There is plenty for visitors to see and do – and if you’re looking for the ultimate sugar hit, head out to the suburb of Manuka where the first FreakShake was created! TRAVEL HACKING IN OZ – Your Guide to use Points & Travel Rewards to go from Beginner to Business Class. With over 500 National Parks, Australia is a nature lovers paradise. Here are our favorite Australian National Parks that MUST be on your Australia Bucket List! Home to the Three Sisters, the Blue Mountains are an iconic Australia tourist attraction and World Heritage Listed National Park located west of Sydney. This vast rugged region has a variety of trails, viewpoints, waterfalls and bike tracks for visitors to explore alongside examples of aboriginal culture and legends and is the perfect place to escape the hustle and bustle of Australia’s major towns. With a range of day and overnight trips available from Sydney – you can take in the Eucalyptus forest, learn about aboriginal legends, gaze upon the sweeping views across the valley, sleep under the stars, jump on a photography tour, or get your adventure on with activities like biking, abseiling and caving. Kosciuszko National Park’s rugged alpine landscape is defined by gum trees, wildflowers, waterfalls and limestone gorges. It’s home to mainland Australia’s highest peak, Mt. Kosciuszko, and the Snowy River in the Snowy Mountains region. Offering some of the countries best ski areas in Perisher Ski Resort (which can be visited on a day trip from Sydney) and Thredbo Ski Resort, which also has a year-round chairlift for valley views. Just a short 1.5hr drive from Sydney and you’ll find yourself in the beautiful Royal National Park. Characterised by coastal cliffs, secluded beaches and eucalyptus-rich bushland, there are endless opportunities for barbecues, fishing, bushwalking, birdwatching and whale watching. Located 240 kilometres east of Darwin in Australia’s tropical north, Kakadu National Park is Australia’s largest terrestrial national park. With terrain encompassing wetlands, rivers and sandstone escarpments, it’s home to some 2,000 plant species, nature and wildlife from saltwater crocodiles and flatback turtles to birds. It is also rich in Aboriginal History and Aboriginal rock paintings, dating to prehistoric times, can be viewed at sites such as Nourlangie, Nanguluwur and Ubirr. You could pend a lifetime exploring this incredibly beautiful park of Australia and this is one National Park where a day trip is not going to cut it. (Although they are available if you are short on time!). For the best experience, we recommend at least a minimum of a 2 day tour – but if you can, give yourself the better part of a week on a 5 day tour from Darwin. You won’t regret it! The Ultimate in Australian ‘Outback’ experiences, Uluru-Kata Tjuta National Park is home to Uluru (also known as Ayers Rock – one of the top Australia tourist attractions) and the Kata Tjuta – the 36 red-rock domes that make up “The Olgas” formation. Located 450km from the nearest town of Alice Springs, both are located in the heart of the Northern Territory’s arid “Red Centre”. Uluru is sacred to indigenous Australians and is thought to have started forming around 550 million years ago. You can fly into Uluru from most major airports in Australia, although there are limited accommodation options available in the Park itself so make sure you check availability before booking flights! RELATED: Spend 4 days exploring Uluru – Kata Tjuta National Park & Kings Canyon for less than $440! One of Australia’s biggest tourist draws is The Great Barrier Reef, off the coast of Queensland. It is the largest living thing on Earth, and even visible from outer space(!). The enormous 2,300km-long ecosystem comprises thousands of reefs and hundreds of islands made of over 600 types of hard and soft coral. It’s home to countless species of colourful fish, molluscs and starfish, plus turtles, dolphins and sharks. It was designated a World Heritage site in 1981 and is one of the 7 Natural Wonders of The World. With a variety of different ways to explore the national park from taking a scenic flight above it, skydiving down to it, scuba diving or snorkeling below it or day sailing through it – there are options to suit everyone! RELATED: If you like water based adventures, you’ll love a P&O Comedy Cruise – They’re the best short break from Australia and leave from most major cities in the country! Located in the heart of South Australia’s Outback, 400km north of Adelaide, Flinders Rangers NP offers rugged mountain ranges, dramatic gorges, hiking trails, peaceful creeks lined with river red gums and abundant wildlife. Famous for Wilpena Pound -a natural amphitheater encompassing the range’s highest point, St. Mary Peak, and the home of two sites of ancient aboriginal art at Arkaroo Rock and Sacred Canyon, it is a diverse national park which is well worth exploring. Due to it’s location, day trips from Adelaide are out of the question, but there is plenty of camp sites available for those that want to self drive, or can be combined with more of South Australia on various group tours such as this 6 Day tour of the Eyre Peninsula (starts & ends in Adelaide) or head all the way up to Uluru on this Adelaide to Alice Springs 7 day adventure! Located in the heart of the Tasmanian Wilderness, Cradle Mountain offers views over Crater and Dove lakes from its jagged spires and is made up of protected rainforests, alpine heathland and rugged peaks. Accessible from both Hobart and Launceston, it is one of Australia’s most beautiful national parks – and also offers one of Australia’s most unique and stunning accommodation options – the Pumphouse Point. RELATED: Explore central and western Tasmania on this 3 day tour from Hobart to Launceston taking in Derwent Valley, Lake St Clair, Henty Dunes, Tarkine Rainforest, Dove Lake and Marion’s Lookout! Freycinet National Park is home to dramatic pink granite peaks, secluded bays, white sandy beaches and abundant birdlife. Located 125km north of Hobart – and perfect for a day trip (self-drive or organized tour) – Freycinet is home to the famous ‘Wineglass Bay’ that is often voted as one of the worlds best beaches. Rising abruptly from the surrounding Western Plains, the Grampians (Gariwerd) is a series of rugged sandstone mountain ranges and forests rich in wildflowers and wildlife including echidnas and wallabies, alongside a wealth of Aboriginal rock art sites. Covering a whopping 646 square miles visitors have plenty of areas to chose from, from the iconic Halls Gap in the North, to picturesque Hamilton in the South, across to vibrant Horsham in the West and historic Ararat in the East. Or for those that are short on time, a day trip from Melbourne is just what you need to experience this beautiful part of the world. RELATED: You can also combine the Grampians with the Great Ocean Road on the 3 day adventure from Melbourne to Adelaide. Port Campbell National Park is the 1750 hectare area along Victoria’s coastal Great Ocean Road, world famous for its extraordinary collection of wave-sculpted rock formations such as the Twelve Apostles, Loch Ard Gorge (the site of a 19th century shipwreck) and London Bridge. The visitors center for the 12 Apostles is free to enter and provides for some incredible photographic opportunities – and if you want more impressive view – opt for a 15 minute helicopter ride or walk down all 86 of the Gibson Steps to see the rocky outcrops from sea level. Located over 2500km from Western Australia, Christmas Island is made up of two thirds national park. Boasting multiple endemic bird & crab species and host to the annual red crab migration – where 50 million Christmas Island red crabs migrate from the jungle to the coast to breed and spawn – visiting this incredible remote island National park paradise will be one of the most “off the beaten path” experiences you can have in Australia. RELATED – Seeing the Red Crab Migration is one of our Top 15 Ethical Wildlife Experiences – click here to find out what the rest are! Kalbarri National Park is one of the most exciting and spectacular in Western Australia. Marvel at nature’s ability to carve the landscape. Explore the depths and heights of the river gorges and sea cliffs and admire the floral beauty of the vast, rolling sandplains. Also known as The Bungle Bungle Range, in Purnululu National Park, is one of the most striking geological landmarks in Western Australia and offers a remote wilderness experience. Located in the Kimberley Region, the 239,723-hectare national park is located approximately 300km south of Kununurra, with Halls Creek located to the south and is a UNESCO World Heritage Site. Climb this Australian landmark for unrivaled 360 degree views of Sydney Harbor, CBD and the Opera House – and on a clear day you can even see as far as the Blue Mountains! There are a variety of time slots and routes – with the standard climb taking 3.5 hours to reach the 440 foot summit (and suitable for all fitness levels); there is also a ‘sampler’ climb to take you half way inside the inner arch (in case you’re not the biggest fan of heights and still want to give it a go!) or there is an express climb which reaches the top in 2.25 hours which runs at a faster pace with fewer stops. Add in the option to climb at sunrise, sunset and anywhere else in between and you can easily find the perfect climb for you and tick this iconic experience off your bucket list! Book your Bridge Climb here! Surfing is an Aussie institution part of the lifeblood of many a coastal town. You’d be crazy not to give it a try whilst you’re in the country, and the laid back beachy vibes of Byron are the perfect spot to hop on a board for the first time. You can take a half day lesson to dip your toes in (so to speak) and see if you enjoy it – or fully commit to learning with a 5 day surf and stay package. And for those of you that can already surf – why not make it a part of your East coast journey and travel up the coast from Sydney to Bryon on a 7 day surf trip? OTHER COOL THINGS TO DO IN BYRON: If you’re not a fan of the surf or other water sports, there are so many other great things to do in Byron such as Visiting the Hippi Mecca of Nimbin; Heading out on the open water for some Sea Kayaking; walking up to the most Easterly point of Australia at the Cape Byron Lighthouse; You can throw yourself out of a plane with a Tandem skydive; Sail out into the ocean for some on-deck Whale Watching (in season); Throw on a pair of fins and get PADI qualified on an Open Water Scuba Course; head south to Broken Head Nature Reserve; embrace your inner yogi (it’s a big thing in Byron! ), visit the weekend markets (which are free) or simply chill out on one of the many beautiful beaches in the area. Read the Ultimate Guide to Byron for more! No visit to Sydney is complete without a couple of beach stops. And with 50 beaches along the coast line there are plenty to chose from! Bondi, Manly and Coogee are iconic Australia tourist attractions and have become world famous (definitely worth a quick stop at least!) – but if you like your beaches a little less crowded or a little less well known, take the 40 minute coastal walk from Bondi Beach to it’s quieter sister Bronte; or hop on a bus from Manly and head up to Palm Beach where you’ll find a long strip of sand, bushland and dunes. Kings Canyon is part of the Watarrka National Park and is located in the Northern Territory. Sitting at the western end of the George Gill Range, Kings Canyon is approximately 6 hours drive from Uluru and 7.5 hours drive from Alice Springs. If traveling independently but without your own car, you can get a coach transfer from either spot to Kings Canyon Resort for around $120-140. From there you can spend a few days exploring the park, marveling at the soaring sandstone walls which are home to over 600 species of native plants and animals, many of which are unique to the area. For those who are not a fan of outback driving themselves, the 4 day Rock To Rock Tour will take you on a 4 day round trip from Uluru with stops at Kata Tjuta, Kings Creek Station, Kings Canyon and the big rock itself. And if you don’t fancy being practically in the water, a cultural river cruise, lunch cruise or sunset dinner cruise may be the perfect way to experience life on the water – without having to propel yourself across it! Arnhem Land is a vast wilderness area in the northeast corner of the Northern Territory and was named after the ship (named for the town on Arnham in the Netherlands) sailed by the Dutch East Indies Company into the territory in 1623. It is defined by rocky escarpments, gorges, rivers and waterfalls and is home to some of the most beautiful scenery in Australia. It’s home to the traditional landowners, the Yolngu people, and permits are required to visit. These should be applied for 10 days in advance, or can be circumvented if you join an organized tour from Darwin where the tour leader has permission to enter. This is at the top of my list for things to do in Australia – and should be at the top of yours too! If not for the incredible photographic opportunities, but to be able to watch the sun rise or set over such a special place to the original owners of this incredible land would be nothing short of magical. Add in a glass of sparkling wine (for sunset tours!) and you’re set for the perfect evening. 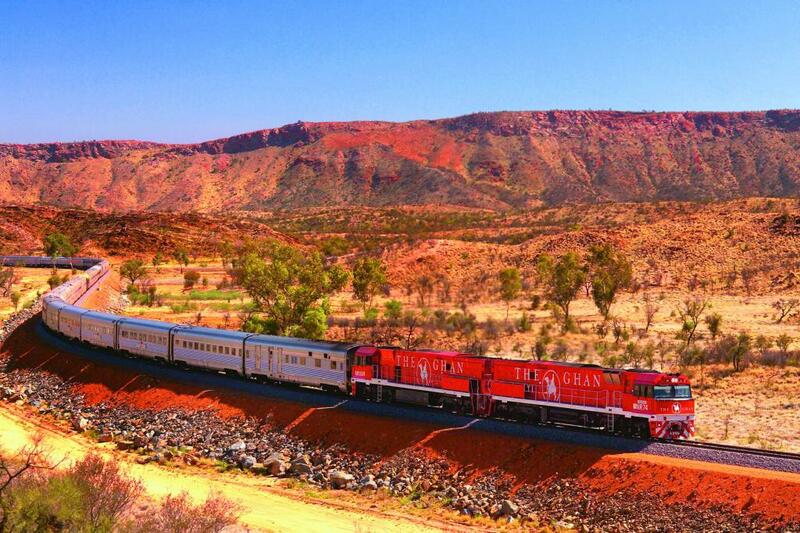 Regarded as one of the greatest train journeys in the world, the luxurious ‘Ghan‘ takes you on an incredible adventure right through the heart of the red centre. The full journey runs from Adelaide to Darwin (or vice-versa) or half journeys start in Darwin/Adelaide and end at Alice Springs (or vv). Book into a private cabin, watch the landscape sail by and get out to explore at various points along the way. And with Gold and Platinum level services onboard, including mouthwatering meals and award winning Australian wines, you are in for one heck of a journey! The Great Barrier Reef is one of Australia’s top attractions, one of the top things to see in Australia and a listed UNESCO World Heritage Site. If you’re a scuba diver, this 2300km long eco-system has to be on your list of dive sites to experience once in your life – and the sooner the better if we’re honest as the damage already done to the reef is not reversible and only going to deteriorate over time. You can chose any number of dives to get your fix – from day dives with snorkeling opportunities, to 2-7 day liveaboards packed with multiple day and night dives, or you can even live on a boat for 5 days and get PADI qualified! Get up close and personal with one of Australia’s deadliest reptiles at the Crocosaurus Cove in Darwin. Marvel over some of the biggest saltwater crocodiles in Australia; meet the crocodile star of the film ‘Crocodile Dundee’; and learn fascinating facts about the resident crocs. You can swim among young crocodiles, or try feeding the crocodiles – if you dare! And for the adrenaline-junkies amongst you, why not hop inside the Cage of Death? For 15 minutes you can be in the water with up to 200 of Australia’s largest saltwater crocodiles in the only Crocodile Dive in Oz. Driving across the beach in a 4WD has long been an iconic Australian image that has drawn visitors in for decades. World Heritage Listed Fraser Island is the largest sand island in the world at over 120km long – but there is more to the island than just sand. On a Fraser Island day trip you can drive down Seventy-Five Mile Beach to see the technicolor sand cliffs of the Pinnacles and SS Maheno shipwreck and overnight camping 2 day or 3 day 4WD tours also include swimming in the crystal clear Lake McKenzie, floating peacefully down Eli Creek and taking in the incredible views from Indian Head lookout – just to name a few highlights! And if you’re not a camper (there’s no shame in that, I’m not a camper) there are 2 day tour options where you get to stay in the Lodge on 75 mile beach. Aj Hackett is famous all over the world for it’s bungee jumps from various different heights and off various different structures. And whilst you can Bungy Jump in Cairns, there is also the slightly less terrifying Minjin Swing where you soar headfirst through the jungle suspended from wires. The flight is smooth and the thrills are big, and even better – you can experience it with a couple of friends or fly with your significant other and find out who screams the loudest! Often visited as part of a multi-day sailing trip in the Whitsundays (above), those who are short on time can still get their Whitehaven fix on this day trip; and for those that doesn’t like sailing – fear not – because you can take a seaplane flight to (and over) Whitehaven Beach – which also fly’s over the reef including the ‘heart of the ocean’ and will give you the most incredible set of aerial photos! (and it’s not as expensive as you might think!) This is really an iconic Australia tourist attractions you can’t afford to miss! Get up close and personal with one of the Ocean’s greatest predators by hopping into a cage and looking one in the eye. A truly incredible experience – and one that is totally safe. Cage Diving trips leave from Port Lincoln and on some boats there is even an underwater sub so you can watch the sharks under the water without getting wet! Coober Pedy is a town in northern South Australia, 846 km north of Adelaide on the Stuart Highway, with a population of around 4000 people, and is known as the Opal Capital of the World. It’s also one of the most unique towns in the world in that the majority of the residents live below ground in homes known as dugouts due to the searing 40+ degree temperature the region often suffers. Go and see this subterranean town, explore the museums and grab yourself a fair dinkum piece of Australian opal. Just off the coast of South Australia lies the wildlife haven that is Kangaroo Island. Over a third of the island is protected in nature reserves and is home to a variety of wildlife including sea lions, koalas, kangaroos and diverse bird species. In the west, Flinders Chase National Park is known for penguin colonies and striking coastal rock formations, like the sculpted Remarkable Rocks and the stalactite-covered Admirals Arch. Hop on a cheap flight from Adelaide, or take the 30 minute ferry across the bay to start you adventure – or if you’re short on time, you could always join a day tour from Adelaide. Add this one to your Aussie Road Trip must-do list. The Eyre Highway is an asphalted highway in Australia that is 1,675 km (1041 mi long), linking Western Australia and South Australia via the Nullarbor Plain. There’s a few hidden spots along the way to keep the journey interesting – such as the Head of Bight (for Whale Watching – May to September); The Bunda Cliffs – one of the longest uninterrupted cliff ranges in the world; and the Border Village – the point where South and Western Australia meet where there is a giant kangaroo for visitors to pose with and a signpost telling you how far away from various major cities throughout the world. Fun fact – you can also play the longest round of golf with 18 towns along the highway participating to make up a full course which spans 1365km! Port Arthur is a 19th Century Penal Settlement which has now been converted into a fascinating open air museum. Allocate a full day to wander round and really explore this historical site. There is so much to learn, and it is a really detailed look at Australia’s convict past. You can purchase tickets on arrival at the site which also include an introductory walking tour or if you don’t have your own car you can join a group tour from Hobart. Move over Northern Lights, the lesser known Southern Lights are just a pretty, and a much better option for those of us in the Southern hemisphere. Often just a trickle of light to the naked eye, a good long exposure shot will light up the sky with incredible colour and light trails. Join the Aurora Australis Tasmania Facebook Group for insider hints and tips for the best places to see the lights along with the best times to visit. Get your action packed water water rafting adventure ticked off with a one day raft on the the King River – or go all in with an 8 or 10 day raft and camping adventure on the Franklin River. Another of Australia’s great Road Trips – and possibly one of the greatest driving roads on the planet, it should definitely be at the top of your list of things to see in Australia. I don’t think you can’t say that you have traveled in Australia until you have driven the Great Ocean Road. Hire a car – or a camper, or if you’re short on time take a day trip from Melbourne. However you want to do it is up to you – just make sure that you do! Melbourne’s iconic laneways are famous not only for the multitude of cafes serving delicious coffee but also some of the most incredible street art and murals you’re likely to see in Australia. Check out this self-guided walking tour to find out Melbourne’s’ best street art spots. I may be a little biased, but the Yarra Valley is my favorite wine region in Australia (it might have something to do with it being 20 mins form my house!) With over 300 wineries in the region and a specialty in pinot noir and sparkling varieties, you can spend all day hopping from cellar door to cellar door, tasting all the delicacies on offer. There are multiple wineries that offer free tastings and if you’re not just into wine there is a dairy, chocolatarie and brewery to keep everyone happy: follow this route for the ultimate tour of the Yarra Valley. RELATED: Don’t forget about the other great wine regions in Australia such as the Barossa in South Australia, Margaret River & Swan Valley in Western Australia and the Hunter Valley in New South Wales. Each have a variety of wine tours available too so you don’t have to have a designated driver in the group! Be at one with nature in Victoria’s first geothermal thermal mineral springs and day spa – located just a short 90 minute drive from Melbourne CBD. From hot springs to saunas, massages to hammams, head here for a day of pure relaxation. And whilst you’re down on the Peninsula, why not combine you visit to the hot springs with a gourmet food and wine session at an award winning winery in the region? Role play as Tarzan and Jane – or take the kids and let them embrace their inner money as they zipline through the trees at the Enchanted Maze Adventure Garden. Test your balance, strength and coordination as you traverse bridges, nets and swings across 50 different obstacles/challenges on this 2 hour adventure. Take a waddle on the wild side and see penguins at the world-famous Penguin Parade, Phillip Island – only 90 minutes from Melbourne. We recommend self-driving down there to ensure you are there for the evening parade – and if you booked early enough try and book onto the Ultimate Adventure Tour – where a limited number of people get to dress up in black and are given night vision goggles before being taken to a secluded private beach where you sit on a seat in the sand and watch the penguins walk right past your feet! (It’s one of the most epic of Australia tourist attractions and totally wildlife friendly!) And no car – no worries! There are plenty of day trips from Melbourne to make sure you don’t miss out on this incredible experience. (Also – if you don’t have time to get down to Philip Island, there are a colony of penguins that have been known to live around the St Kilda Pier – but you won’t be able to get as close to them as you can down at the Parade. The friendly pod of wild bottlenose dolphins regularly swim to Monkey Mia’s shore to interact with humans up to three times a day, although they are mostly seen in the morning between 7am and midday. On average, seven or eight dolphins regularly visit the beach, with up to 20 other dolphins visiting only occasionally throughout the year and the beach has become renowned as one of the best and most reliable places for dolphin interaction in the world. The eerie, luna like landscape of the Pinnacles Desert has fascinated visitors for decades. Located in Nambung National Park, the weathered rock spires of the Pinnacles rise out of yellow sand dunes and would make for an epic filming location for some star wars type feature! Combine your visit to the wildlife center and meet some of the friendly local koalas before trying your hand at sandboarding down some of the nearby dunes to make a complete Pinnacles themed day trip from Perth. It’s real name is Lake Hillier and it is located in the Goldfields-Esperance region of Western Australia (approximately 720km South East of Perth – which is an 8 hour drive or a 2 hour flight). It might seem a long way to go for one of the saltiest bodies of water in the world, but there is also the magnificent Lake Hiller – another pink lake on Middle Island, the largest of the islands that make up the Recherche Archipelago, along with incredible snorkeling and scuba diving opportunities. Whale Sharks are the largest fish species in the ocean and they survive on a diet of plankton. (No scary sharp teeth here!) These gentle giants rely on the warmth of the sun to change their body temperature and that is why they are often found near the surface for extended periods giving us an incredible opportunity to share the ocean with them – from a safe distance. Whilst it is possible to Scuba Dive Ningaloo Reef, the best experience – and GoPro photos – will come from simply snorkeling with them. Day trips are run from Exmouth between March/April and August (as that’s when they migrate along the coast) and are a one-in-a lifetime type experience for visitors to Australia. And between June and November, you may even spot some Manta Rays too! Head on over to one of Western Australia’s favorite Island getaways, packed with secluded white sand beaches, native wildlife and that laid back relaxing vibe only an island can give you. As one of the best places to visit in Australia, to get there you can jump on the ferry (return tickets are around $70) or join an organized tour that will include a cruise around the island. Both allow you free time to rent bikes, laze on beaches and explore the Island before returning you to back to the mainland. The 15m high unusual rock formation known as ‘Wave Rock’ has become the darling of Instagram in recent years, along with other interesting rock sculptures in the area such as Hippos Yawn. Visit this incredible site, and others on a day trip from Perth where you’ll learn all about local aboriginal culture and folklore and visit sacred sites such as Gnamma Holes. And that’s a wrap folks – if you made it all the way to end – good job & thank you! I hope you enjoyed our travel guide to just some of the Incredible Things To Do in Australia, packed full of travel tips to help you start ticking off all those Aussie Bucket-list worth adventures and experiences. And if I’ve missed your favorite Aussie experience, let me know in the comments below! Hi There! Thanks for reading our post about the The Big Australia Bucket List – Australia Tourist Attractions & Top Things to Do In Australia! I just wanted to let you know that this post contains affiliate links, which means if you purchase something after clicking a link, I may get a small commission – which is at absolutely no cost to you. If you enjoyed this article and are going to be searching for some of the things I mention anyway, I would love it if you could click through from the links above & thank you in advance! Read my full Disclosure here. Wow, you have covered an amazing list of places to see in Australia. There is something in there for everyone and so great to include so many places in WA which often get overlooked. Thanks so much Lyn – I know the West doesn’t get much glory so it was nice to highlight just some of the incredible things to see and do over there! I was in Australia just last week. I visited Canberra, Melbourne and Sydney. I found Melbourne more exciting than Sydney. Though I loved the Bondi to Coogee seawalk. The views were breathtaking. What a great post! My 5 year old really wants to go to Australia so we are hoping to soon. I love that you break down all the different areas. This will be super helpful in helping plan our trip! Thanks Maggie! I hope you get to visit soon! Visiting a national park in every country is a great goal to have! Omg what an exhaustive list. I have been only once to Australia and I have only scratched the surface of what this country has to offer. Wineglass Bay is one of my favorite beaches in the World and you cannot express its beauty in words. I would love to visit the Uluru and Gold coast. You know Australia was never on my wishlist mainly because I’m not a beach person but only till recently. Lately I have been reading a lot of blogs about the country and I am liking it and I think I can give it a try. Sydney & Melbourne are of course in my bucket list – that opera house is a must watch, but I would like to climb the Sydney harbour bridge , that sounds adventurous. That sea lion is so cute, I saw one myself at a zoo but swimming with them would be a memorable experience I’m sure. One more thing I liked in particular is the coastal cliffs on most of the beaches there, they are gorgeous really, so photogenic and also a nice place to hangout. I have never been to Australia so could try every one of these buck list items. The one I would choose first are to visit Melbourne. So many sports are based there such as the Australian open tennis , the golf at Royal Melbourne and the grand prix. As I would like to see all seven natural wonders of the world I must also see the great barrier reef. Hobart sounds good for the delicious fish and chips! I might literally have to relocate to Australia. This is abucket list that can last for a whole lifetime. I know Aussie is home to many body of waters but these beaches are amazing. The Fycetin beach, Daintree National Park. I love the Great Barrier of Marine Park. I love everywhere in Australia and I can’t wait for a proper tour. Australia is beautiful! Haha! I did relocate to Australia and I still have soo much of this list to do! But I agree – Australia is so beautiful! I have lived in Australia for 1 year and really found all things which you have listed are really a worth. Melbourne is my favorite for its Yarra valley and Great ocean Drive. I cannot forget this Drive till now also. My other favorite city is Sydney for its cosmopolitan atmosphere. I have missed Wave Rock and it really looks beautiful. Thanks Yukti – the Yarra Valley in Melbourne is one of my favorite spots too – but i’m biased – it’s only 20 mins from my house! What an awesome list of things to do! I have never heard of Adelaide but I checked it out after reading your post and it sounds incredible. The beach there looks beautiful. I will be saving this post for later! I have been dying to check out Australia for the longest time and this is by far the most comprehensive guide I’ve read! Definitely bookmarking it and ughhh I feel like I’d need an entire month here to get through this list! My top things to check off would definitely be Whitsunday, the Pinnacles Desert and Cable Beach camel parade. Thanks for sharing!! Thanks Jas! It took me a few months to put together so I’m glad to hear it’s the most comprehensive that you’ve read! And if I’m honest – a month here may get you the highlights in a couple of states – but I think you’d need 3-6 months of serious travel to cover everything in this list! Beautiful post! I believe you wrote about pretty much everything? saving his for later when I finally go to this amazing country ???? Thanks Karolina! I hope you get to visit soon! This is the most EPIC list! But so well done and I’m glad someone was willing to put time into a post like this! Australia has been on my bucket list since I was in grade school so I am definitely saving this for the time I am able to make it down there! OMG… This is really appreciable post that you have done Vicki, Your efforts behind this post is truely awesome. Australia is one of the best country & there are amazing thing to do or traveling but this post is completely awesome to know more about thing to do or see. Thanks Sandy! I’m glad I could find a couple things to add to your list! Loved the impressive list. But then any list of Australia surely will be looooong. Especially loved the great barrier reef and the blue mountains. My favourites when I visited last year! Thanks Sreekar – and yes – with the sheer size of Australia, this Bucket List was bound to be super long – and there is still so much I didn’t include! That’s a big bucket list for sure! I loved exploring Australia, and think that cuddling a koala and seeing the Great Barrier Reef would be my top recommendations. Thanks Tamara! And totally with you on the Koala and GBR! OMG! What a list! Commendable work by you to compile this so meticulously. No less than a guide I will say. And now how much I am craving to see all these. Wow! That’s like too many and I haven’t even started yet! I know Canada’s National Parks are a must-see but Australia does have several amazing National Parks, too… The views at the Grampians National Park is breathtaking as well as the Kalbarri National Park. I can’t wait to see the views from the Skywalk when it does open! Oh and of course, the Great Ocean Road! ;) A snorkeling opportunity (I still don’t know how to dive. LOL) at the Great Barrier Reef is definitely on top of the places I want to see in Australia. And this is the first time I heard about the Southern Lights. It looks beautiful!!! Thanks Marvi – Australia sure does have so much to offer visitors! I think it will take me a lifetime to get through this list! What a comprehensive list! But then again, we all forget that Australis, while being the smallest continent, is one of the largest countries in the world. I found the section on Aussie experiences really interesting and useful. Pinning it for inspiration as and when I travel to this beautiful country. Thanks Shweta! I’m glad you enjoyed it and I hope to get to visit soon! wow… what an exhausting list! I mean… the internet is full of random silly listicles but this is a definitive list. If one has to make a list, that should be like this! I though I already knew enough about Australia but now I know even more! The best part was teh Aurora, I did not know one can get that down under! Thanks Jitaditya – and you’re right, it’s definitely not your ‘usual’ listicle! It sounds like you packed a lot into your last Australia visit – I hope you get to come back soon and tick some more things off your list! I’m a huge fan of Australia as it closely resembles Canada both in way of life and nature. It’s very high on my list and this is the absolute perfect list. I love the must see big cities but I’m drawn to the allure of the outback. The Uluru-Kata Tjuta keeps calling my name. It’s so beautiful. From reading many blog posts about Australia or blog post from Australian I sorta feel familiar with a lot of the places on my list. I think it’s time I get to know all these places s little better. What an epic bucketlist! Really hammers in the point for us, who have been traveling for the past 10 years and recently settled back home to Australia, that there’s so much to discover at home. We’ve made a pact to focus on domestic travel within Australia now that we’ve seen a lot of the world, but we’re certainly not going to be bored! From the desert to the coast, wildlife experiences like swimming with whale sharks, to the hiking, and then cosmopolitan cities and cultural attractions like Sydney – got quite a bit to do!! Thanks Meg – I’ve been in Australia 5 years now and keep saying I’ll focus more on travel here, but always end up dragging myself off overseas! I definitely have a lot to tick off this Australian bucket list myself! Just stop it. Like I don’t have enough national parks to visit between the USA and Canada. Now I have just added a most of the ones in Aussie land, too. Haha! Sorry about that Jennifer! But we do have some incredible National Parks over here – and it’s always good to have lots on your list – it means you have options for things to do all over the world! Wow! this is a complete list, thanks for posting this great information. We plan to go in Australia this year since it’s already been a long time when we visited. What a beautiful place. If I have an opportunity, I will get to Australia for sure. Thank you a lot. I think I will get several unforgettable memories.